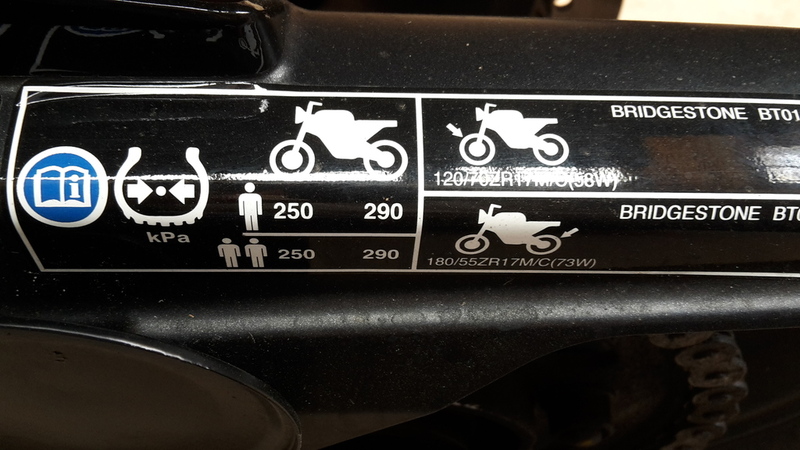 no owners manual,so i got to order,looking for the correct tyre pressure,bike came with Maxxis tyres which i hear are bottom of the range (correct me ). max psi on side wall is 42 psi but reckon should stick to manufacturers guidelines,what ever they are ? can anyone help with the 250/290 explaination. 42 psi is good. You can run a little lower if you want, depending on what kind of riding your doing. The 250/290 is the pressure using kPa scale. thank you,it has been very helpful and i will make some adjustments,checked yesterday on cold tyres and it was 35 front and 38 at the back. You can also take into consideration the temperature that your riding in and the distances. I just bought a CBR600F 2013 Model.. I live in Turkey and the weather here is hot. so should I stick according to the manual tire pressure or what would be the best.